Hello Everyone! Welcome to Launch! Hope you are enjoying the game! wind and on the sea. minute. The clouds were growing darker making the midday sky look almost that of midnight. because of bad weather. If the Captain stayed strong so would they. at Jack and the Captain. Shaking off the water Jack reached to take the wheel. right and they were definitely heading into trouble. and she stepped aside once he got hold of the spokes of the wheel. She remained at his side though. done so many times. They all knew this route blindfolded. But this weather was just too strange. One of the crew yelled down from the crow’s nest but it was hard to hear him over the wailing wind that was blowing. All she could do was look in the direction he was pointing. And there it was. A huge spinning vortex just at the sea horizon. This was something she had only heard about from other sailors and captains. Usually over many pints at local seaport pubs. She never thought she would ever be witness to it herself. Immediately she grabbed the wheel from Jack and started trying to turn the ship around away from the blue glowing entity. There was no way she was gonna let that thing swallow her ship and crew. The wheel seemed to have a mind of its own though. No matter how hard she and Jack tried the ship was heading straight for the vortex. She called out commands for the crew to man the sails, but they fell on deaf ears. No one could hear her commands. Many, however, jumped to action. Seasoned sailors were good at predicting what the captain would command and this crew was one of the best. Try as they might the sails were not cooperating with the crew. Just like the wheel. Almost as if the vortex was commanding the ship instead of her. Gripping the wheel harder she tried her best to steer the ship away but there was nothing for it. The Black Rose was no longer under her control and there was nothing she could do about it. As if by magic or whatever the ship steered straight at the vortex and the all the crew and her captain could do was wait and watch the Black Rose slip away through the swirling blue of the unknown. Calm winds surrounded them as they passed through the vortex. Sails flapped aimlessly as the crew tried to contain them. The wheel became slack in her hands and slowly steered as if on the calmest of any sea. Looking at Jack she shook her head in disbelief. Jack nodded and stood steady at her side. Just as quickly as things seemed to calm the ship started for another vortex. This one was different. A huge opening like the other only black as night. Swirling intensely. The winds began to pick up again, but the waves did not. Calm water and wild winds were something none of them had experienced before. As they got closer the loud wailing of the winds became ear piercing. The crew began collapsing on the deck where they had once stood. Jack as hard as he tried soon joined them. The only one left standing was the captain. And soon the sound overtook her as well. The Black Rose was going through yet another portal only this time with no crew or captain at the helm. Drenched from head to toe she tried to raise up on her hands. Slowly lifting her head to survey the damage to the ship she realized she was no longer on the ship. Grass. Lush green grass and a fragrance on the air she had never smelled before. No salt in the air except that which came from herself. Looking about the surroundings were strange yet beautiful. Almost in a trance like state she turned looking at all the foliage and lights about her. Some of the plants had a luminous glow about them. Soft chittering of creatures and chirping of birds made it all so tranquil compared to the last thing she remembered. Remember. The crew. Jack. Where were they. Scanning around the area she went to look for them all. Someone had to have survived as well. Walking to the edge she looked out and there was nothing but sheer drop off over the edge. Slowly she walked the perimeter of the area as close to the edge as she dared. Looking carefully to see if there was land below. She could see specks of land masses below, but they seemed so far away. Finally making her way back to where she started she sat down to think. But darkness overtook her again from fatigue. As she drifted off into the darkness of sleep she blinked her eyes and saw something coming towards her, but she was too exhausted to stay awake. Weekend Flash Sale: Vendors, Signs, Numbers & Letters! Elgarion De’Kahli hobbled his way up the well trodden cobblestone road, entering the prosperous town of Owl’s Head. Supported by walking stick, weighted by a somewhat cumbersome leather sack of books, the old man pressed forward as if this journey had become one of routine. With keen eyes intent upon the bridge ahead, leading into the town proper, Elgarion stopped a moment to take notice of a quaint yet elegant cafe along the right side of his path. “Briar’s Cafe…” he mumbled to himself as the thinly man considered his options. With feet sore from travel and a shoulder aching from the slung sack, Elgarion decided he would take a pleasant and unexpected break before retiring at Fire Lotus Tavern. This eve, he would sit a while and enjoy something new. Pleased by the gracious attentiveness of the host, Elgarion was guided to a table of his choosing by the bar, slightly elevated from the rest. The scent of spiced mutton stew caused his parched mouth to find water yet again and spawned a grumble in his belly. Chuckling to himself and before even taking to seat, the elderly man, with a kind smile, stated to the host, “It would seem my body has decided for me, my friend. Please… might I have some of the fine mutton stew that lured me from the streets with its fine savory aroma? 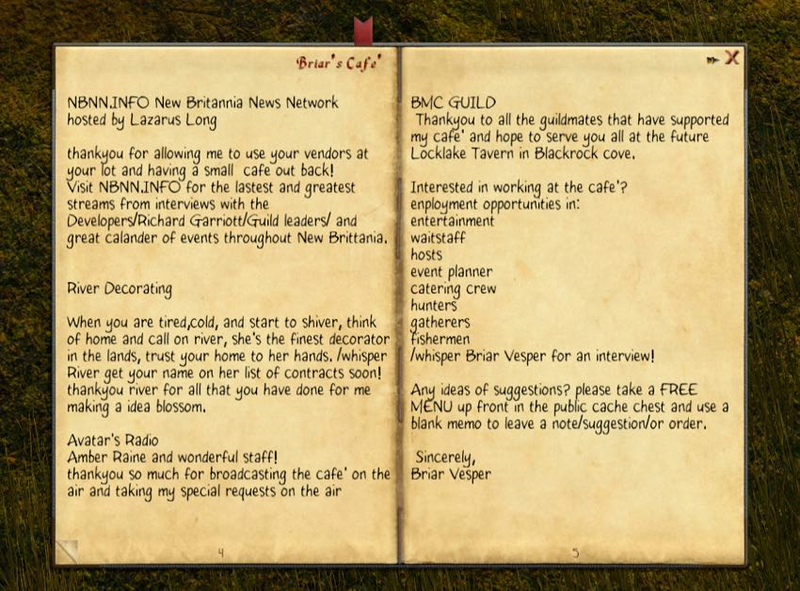 Also, a mug of ale… something local, please.” Nodding, the host scurried away without taking anything to paper. Elgarion then placed the sack down onto a bench and began to remove several books, scrolls and parchments, spreading them out before him, yet leaving ample room for a mug and a bowl. Once he felt his dinner was well planned by a carefully arranged assortment of reading materials, the decrepit yet devout follower of Artenius lowered himself down onto the bench with occasional winces of pain from road wearing muscles ranting him for rest. 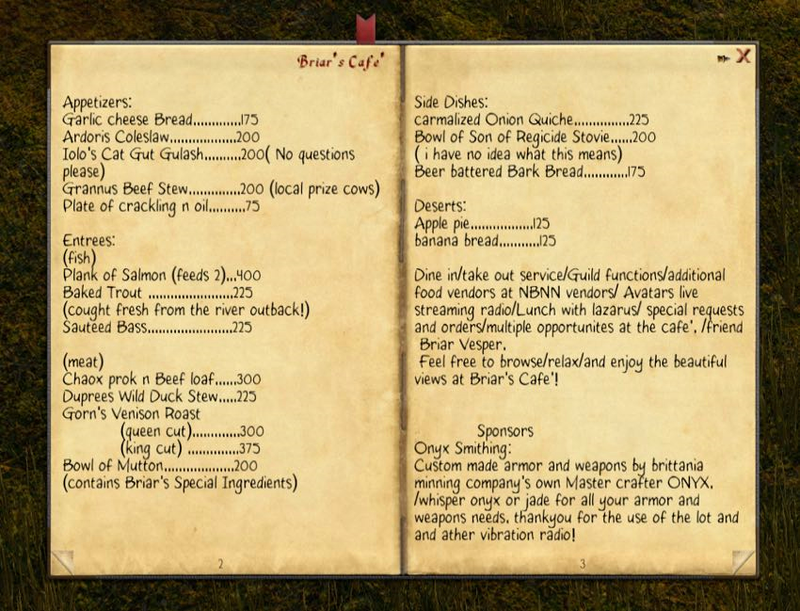 As Elgarion waited patiently for the mutton and ale, an elegantly bound menu caught his eye resting at the table’s center. 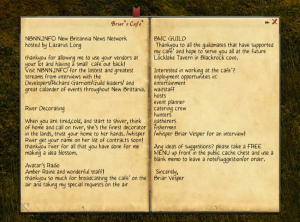 He took up the menu with delight, planning what might satiate him upon his next visit to Briar’s Cafe. As his gaze drifted across each page, the old man smiled more and more. In good time, the host dutifully returned with mug, dripping with froth, and bowl steaming with spiced allure, and Elgarion’s eyes widened with ravenous anticipation. “Good man, thank you so much for being so quick and generous. It is not uncommon for one such as I to be delayed service, placed in a corner far from view for other patrons, or simply turned away. And alas, you’ve done me such a kindness. The finest table. Expedient service. And from what I can detect, the most delicious of foods.” The host paused a moment at this comment, bewildered slightly and only bowed and backed away with a gracious smile. Elgarion’s lower jaw quivered slightly as if words had trouble escaping him, “I… I… you do this old man a kindness, friend. Alas, I have not felt so welcome in this new world as I do in this very moment.” Elgarion braced himself against his staff as if to attempt standing for the soldier, but the man insisted the weary traveler remain seated upon the oaken bench. “Please, my lord. Do not rise, your stew awaits, and I distract you from its wonders.” Before Elgarion could respond, the infantryman came to quick attention, issued a flamboyant salute, then hastened southbound onto the nearby road. The venerable sorcerer of Artenius’s eyes followed the soldier for a moment, but as the armored man slowly drifted away from view, Elgarion’s thoughts gradually deepened into his current state of affairs. 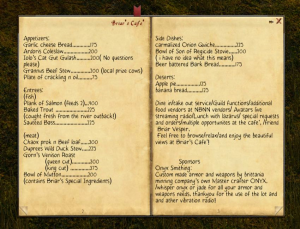 With one final glance upon the menu of Briar’s Cafe, he set it aside and looked upon the books which were placed around him. Maps, lore, myth and missives, even magical incantations littered the table around the bowl of mutton stew, now being ladled into Elgarion’s mouth, dripping down his unkempt and wispy beard. With his attentions intent upon study, the delicious meal merely brought the wizard satisfactions deep in the recesses of his mind, as his truer passion and hunger were now being satiated by the knowledge which surrounded him. For hours Elgarion labored over the writings, absorbing anything which might reveal even the slightest hint of where the Moongate within Kahli once stood. Already having discovered Kahli, nestled between The Bone Spires and South Marsh, aside the village of Braemar, Elgarion’s search was now narrowed and refined. A path to his is lost people was no longer concealed amidst an entire world. Now, the search spanned only to an area of mere miles. For behind this elusive and fallen rift, if it could be found… reopened, if he could step inside and return to The Void which he for centuries craved escape, then the Marquis of Kahli could return to the imprisoned and forgotten citizens of the once great city and deliver them from their accursed fate. Many hours passed as Elgarion took to his research until the hours grew late. The wizard wiped stew from his beard on a dusty sleeve, gathered his works and placed them gently into the leather sack, took up his gnarled staff, twisted with age just as he, and hobbled his way out of Briar’s Cafe. 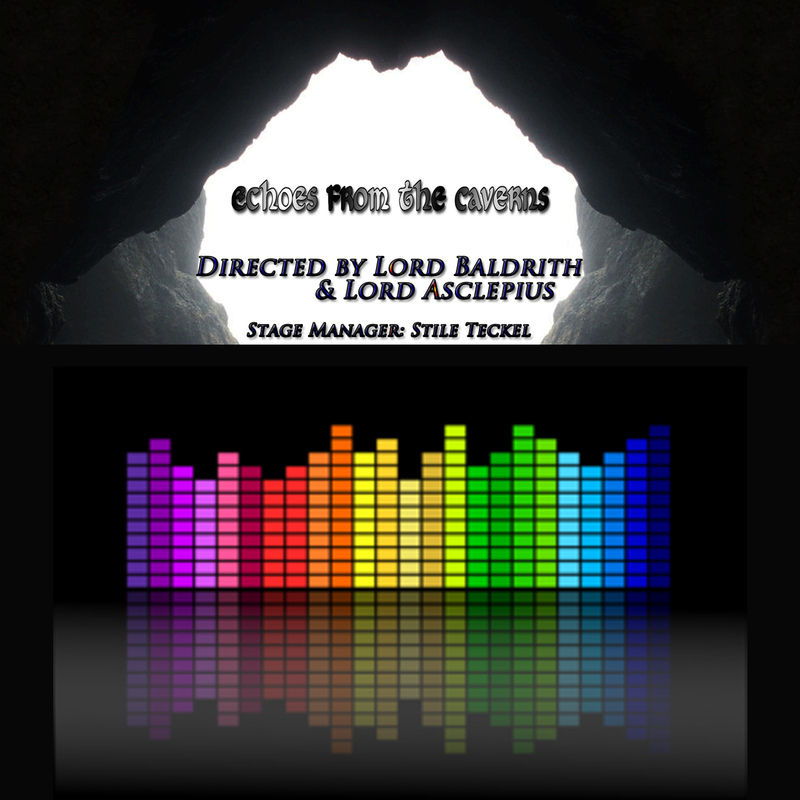 With a wave to the host who stood diligent at the entrance, Elgarion turned northward up the cobblestone road, heading once again to his lodgings at Fire Lotus Tavern. Upon reaching the bridge, a voice ahead caught his attention. The town crier of Owl’s Head approached, bellowing forth with vivid clarity of the recent happenings in nearby lands. Elgarion stood silent as the man approached, taking in the news with a smile. But what came next pleased the sorcerer greatly. For the crier took to providing the old man a conversation which likely, the wizard would remember for years to come. For the first time, from this interaction, Elgarion began to realize that the lands were healing. The roads were opening and news from abroad was once again reaching the lips of criers and kings. Just as Kahli had been found, so many other villages, towns and crossroads are being revealed to the world. Each with their own amazing stories of how they survived or arose from the ashes of The Fall. The world awaited him. The world await them. New Britannia was ready for the return of The Avatars. And his peoples, once freed, would enter into a new world, vibrant and ready. 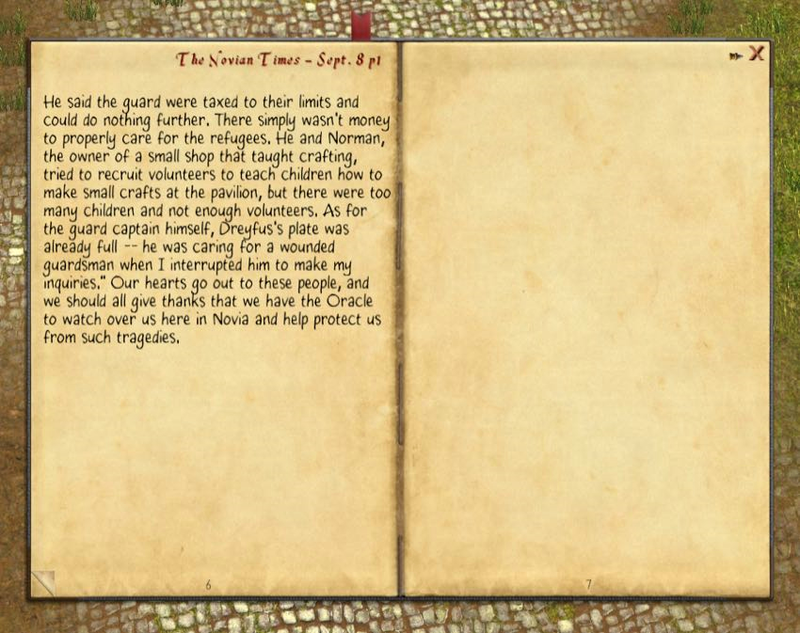 Elgarion waved kindly to the crier, attempting to give sign of thanks to the crier’s services. “Hear ye! Hear ye!” again he exclaimed. 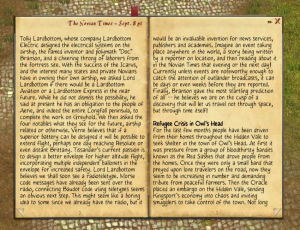 “Lord Enmar decress that all displaced persons declare themselves at the guardhouse by the Upper Marketplace.” The crier returned the wave to Elgarion and approached. “Come to tip the town crier, sir?” The crier bowed to Elgarion, kindly. “Greetings, friend. 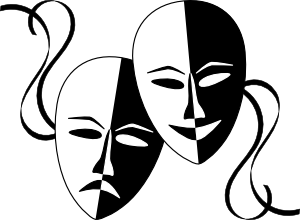 A fine voice for a crier, I must say.” Elgarion complimented the crier as he returned the bow with a slight wince, relying heavily upon his staff for support as he did so. “A tip? Why certainly, friend. 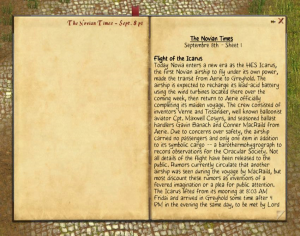 You do a fine job keeping the citizens here informed.” Elgarion rummaged through a pouch at his hip, which by the jingle, only contained a small number of coins. “You honor me, sir. It’s thirsty work, I must say…” the crier claimed a fact likely influenced by the man’s love for ale. Elgarion nodded softly, feeling slightly embarrassed to have suggested such an establishment of finery to one unable to afford it, “Oh, indeed Markus. In fact, that is where I now head, for I lodge at the Fire Lotus.” Almost thinking their encounter was ending, Elgarion began to gather himself for the remaining journey up the hill, “I hope our paths might cross again. I typically come to Owl’s Head to…” Elgarion paused as if gathering his words carefully, “regroup my thoughts.” Just as Elgarion was about to bid farewell, the weary old man was pleasantly surprised by Markus’s next remark. 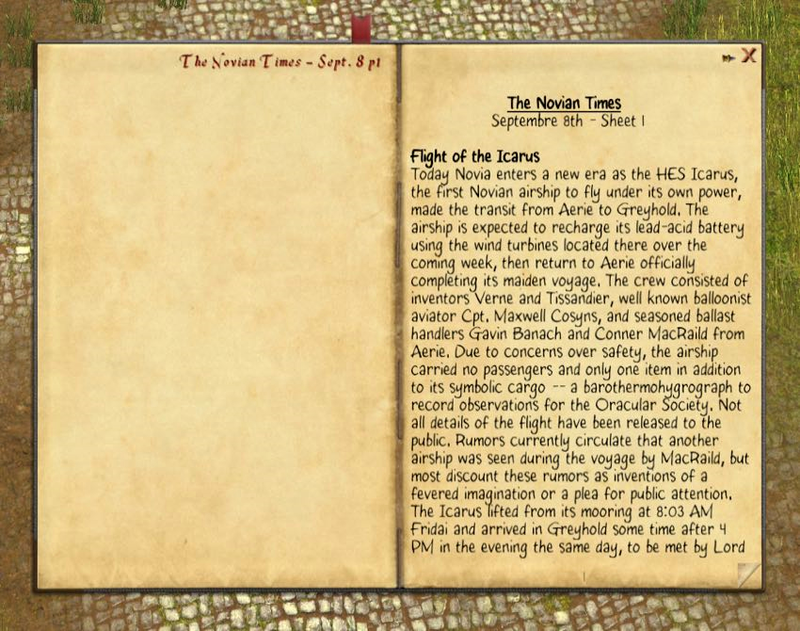 “Would you like me to repeat the news of the day, sir?” the crier suggested with enthusiasm. “Indeed I would! In fact, I’ll be sure to recount your news to my daily scribbles within my journal.” The sorceror began to listen intently with a smile of appreciation upon his face. Elgarion shook his head sadly and his expression soured at the unfortunate news. The crier continued dutifully, “Hear ye! Hear ye! Found: One white rabbit. If you are the owner of this animal and can describe him properly, please contact the refugee family by the river.” And again, he repeated, “Hear ye! Hear ye! 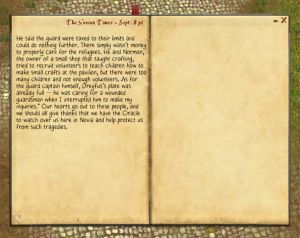 Lord Enmar decrees that all displaced persons declare themselves at the guardhouse by the Upper Marketplace.” Upon reaching the end of his script, Markus stepped back to Elgarion and lowered his voice. 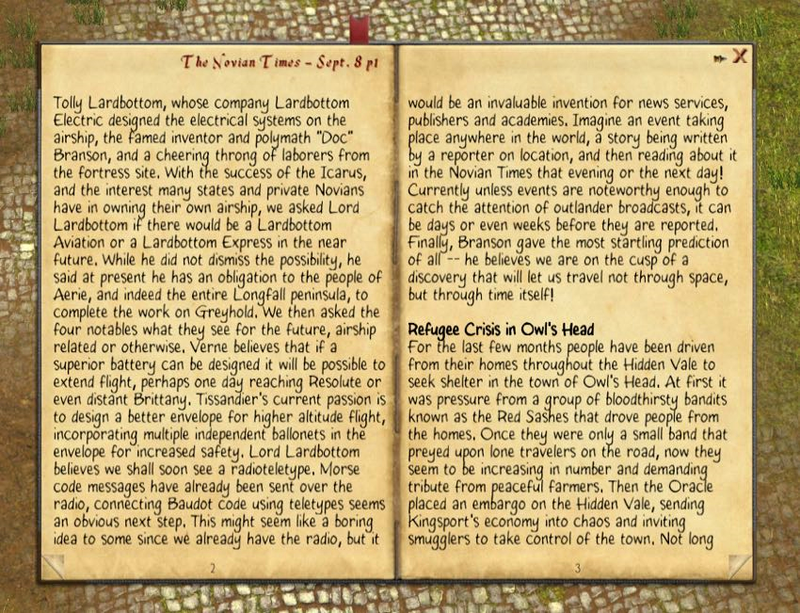 Elgarion took this news with a grimace, influencing even further sympathy for the family. After a pause and a sigh, Elgarion spoke with kindly affection, “Markus, you have a talent. Certainly, if you keep it up, you could announce the arrival of lords and kings at court.” Elgarion bowed slightly to show additional appreciation. “This pavillion you speak of… do you think any copies of the newsletter remain?” The old seeker of knowledge inquired. “Of course, sir! 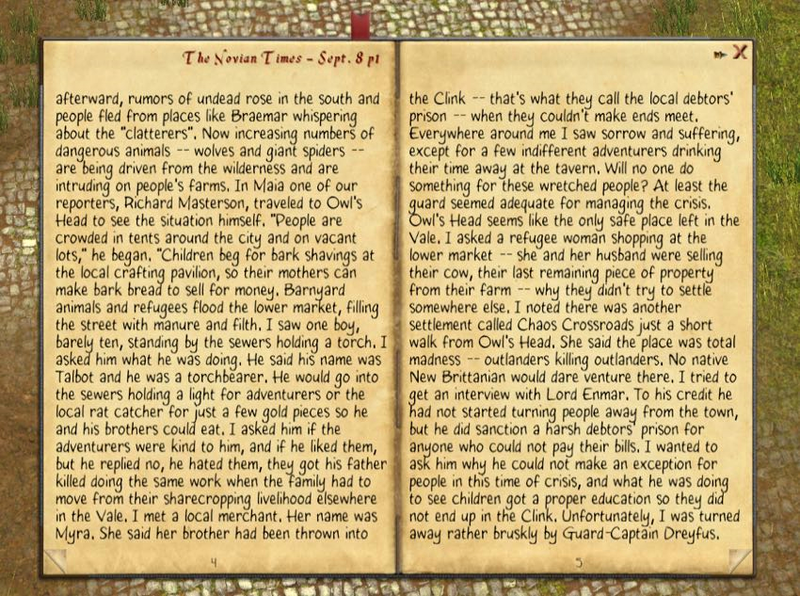 I must return to me duties…” Markus, the town crier said with obvious pride for his trade. Markus aided Elgarion in collection of his staff and sack, then shook the old man’s hand heartily. 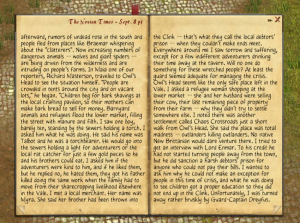 “It has been a pleasure meeting you, Elgarion, and I wish you well in all your future endeavors.” The town crier stated this farewell with sincerity, then stepped back from the wizard and returned to his duties. Greetings Fellow Avatars! On my own today as Lord Baldrith has called in sick. Get better soon! Elgarion hobbled on aching feet up the steep staircase at Bear Tavern, a faint smile upon his weary face. The week had been long with sun, wind and road beating upon him, but again it ended on a pleasant note–amongst the patrons of Bear Tavern, the townsfolk of PaxLair and travelers from beyond its borders. Tonight, he would not write in his journal, save one singular passage. There was much discussion this evening about Outlanders and Avatars. Having been emboldened by drink, I made suggestion that they were one in the same. Others were in agreement. This is of considerable relief to me. If this be true, then I rejoined the world at a time in which the Avatars have, in fact, returned. Relief… should another emotion instead burden my spirit? Some blame The Fall upon the Avatars. That answer is not clear; even after my considerable research I find too many conflicting texts. Relief… my people… still trapped within The Void, possibly by fault of those whom I now befriend. Avatars. And I feel relief in their return. Perhaps I am wrong. Perhaps those who agreed with me are also mistaken. Maybe the Avatars are still something of our distant past, never to resurface. All I know, is I am no Outlander. I am of this land and no other. As are my people. And regardless of possible errors of their ancestors, I trust in my new friends, that their offers of aid are genuine. And I trust, if in fact the Avatars have returned, they know not what they did. Again, Balec treated us as royalty, ensuring we enjoyed our evening. My dearest of friends Blake Blackstone the Dwarf and Stryker Sparhawk from White Hart again took refuge here this eve. Luka, the kind bartender from the Order of the Drunken Elder’s Tavern accompanied us in good spirit. Tolly, a new acquaintance of mine took great interest in our talk of Outlanders and Avatars. Such an odd surname he has. Gabriel Nightshadow happened by, a man which I had not seen for some weeks. It was good to see him again, and I learned something new of him. He openly claims to be of a time forgotten, but the circumstances for his claim seem entirely foreign to my own. I dare not speak as openly as he of my calamity. I fear most would think me insane. Adnor Sundragon sat next to my friend Stryker and provided him good company. Grimace? Another new acquaintance. He also spoke much of The Fall. Grimace. A surname perhaps? A nickname… I am not certain. Interesting, nonetheless. There were others, many of whom I cannot recount. Jack Frost be one, a man who I see often. I shall make better accounting of those in attendance in the future, for these notes might prove valuable, but I truly thank them for their camaraderie this evening. Our spirits were high, and our steins repeatedly empty yet filled again. 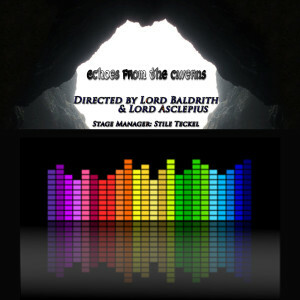 Elgarion paused a moment and stretched his aching back. Thinking just to rest his eyes, he let his head sink into his folded arms while sitting at the desk. One minute became two. Then ten. Perhaps another paragraph would have come if sleep did not overtake him. The candle slowly burnt away. The quill in his hand dried, as did eventually his ink well. The darkness took him again, and Elgarion De’Kahli returned to his people. A familiar yet haunting poem echoed in his unconscious mind as his spirit flittered about The Void in hopeless confusion. All light escaped my sight. Why… why? My futile wanderings… in vain. Darker than the moonless night. The Return of Tech Talks!